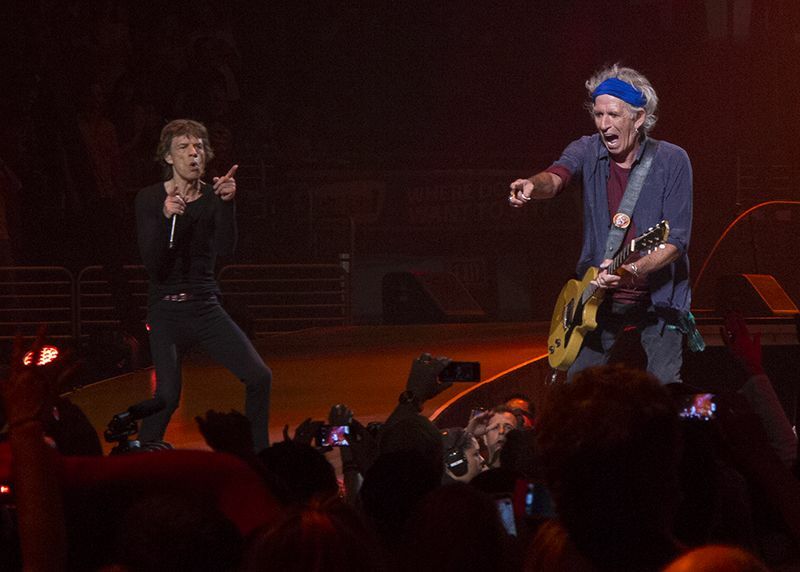 The Rolling Stones could not have started their tour better than they did tonight. From the guests to the song selection, to the way the band really seemed to be enjoying themselves, to the enthusiastic Staples Center crowd�it definitely ranks as one of the best shows I have seen. I initially had some concern whether the City of Angels� obsession with celebrity would surpass the music, when before the show everyone suddenly stood up as if the Pope or Queen had entered the room, and then pointed their cell phone cameras at�Jack Nicholson. The actor�s reputation as the number one fan of the Los Angeles Lakers basketball team played nicely into a few jokes by Mick Jagger. 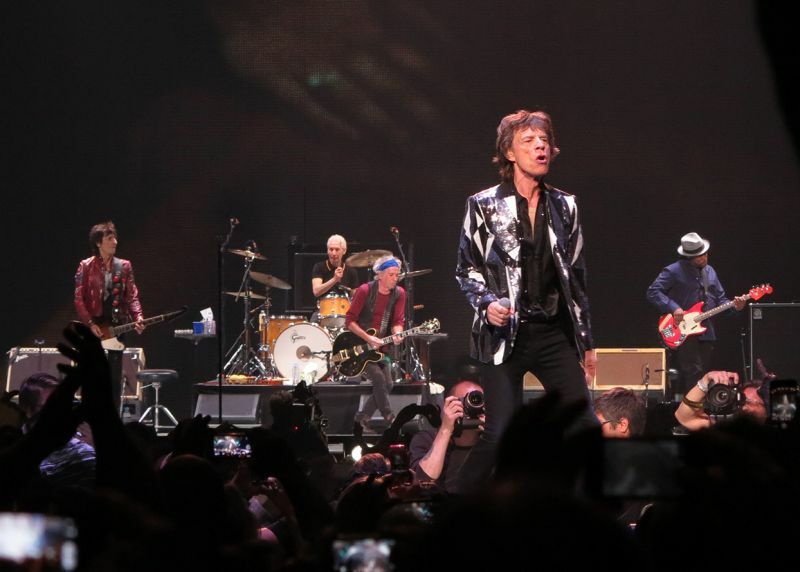 Jagger apologized for any inconvenience to fans because tonight�s show was moved from May 2 to May 3 due to the NBA playoff schedule, adding, �We know it didn�t matter for Jack Nicholson because he would be here either way�. Later Jagger poked fun at the often-criticized advanced age of the Lakers, saying about the Stones, �We�re just here to make the Lakers look young�. If there is any question whether L.A. is still a Lakers town, the answer was easily seen by sales at five merchandise stands I checked: Lakers themed concert shirts were sold out, while Clippers (the arena�s other basketball team) and Kings (L.A.�s reigning hockey champions) shirts were still available. The L.A. crowd did prove to be great, standing throughout the show and welcoming the two new songs and rarities. A highlight was the thunderous and sustained ovation after Keith was introduced, to which he responded by growling a simple three-syllable exhibition of his trademark style and cool: �HEY L.A.�. Despite all the pre-show promotion that the band will �be on at eight��a pattern we grew wise to during last year�s shows�an updated pre-show video did not begin until 8:58p.m. 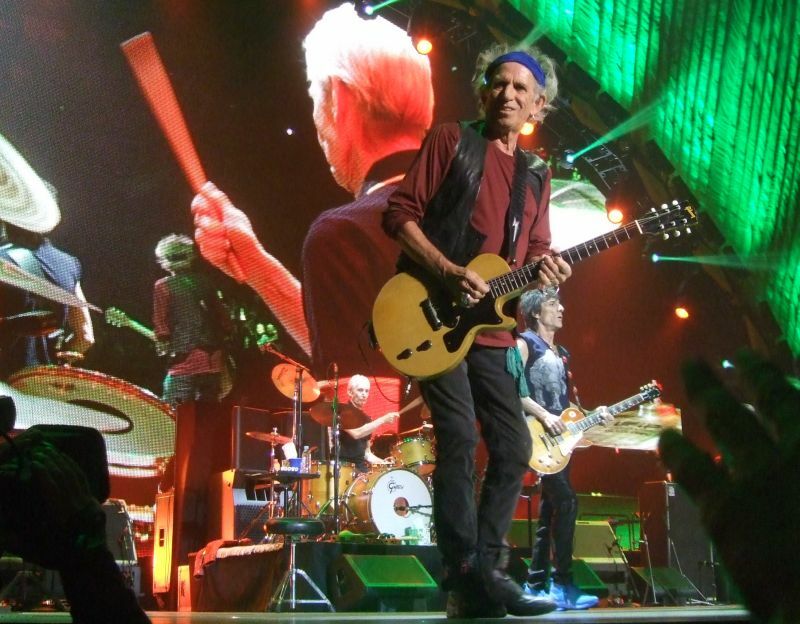 The Stones opened with Get Off of My Cloud, with some sound problems and distortion quickly solved within a few seconds so that sound was great for the rest of the evening, with Keith�s backing vocals on the first two numbers loud and strong, really making it sound like the Stones we know and love. 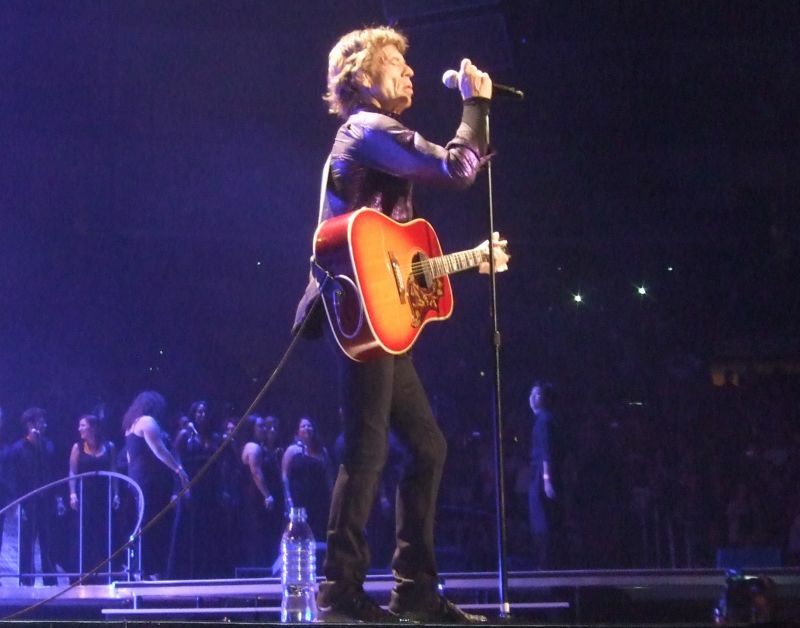 Gimme Shelter was excellent, as thankfully there was not a special guest for the female vocal, with Lisa Fischer dueting with Mick as she did just one time during last year�s shows. Gwen Stefani joined the Stones on Wild Horses, and sadly the quality of her performance could not match the quality of her hair extensions; she messed up the lyrics, but still managed an endearing though flawed guest appearance. Keith Urban was a real surprise, joining the band for Respectable in a similar spot that John Mayer appeared at last December�s Newark show. Urban had appeared at Eric Clapton�s Crosssroads Festival last month at Madison Square Garden, performing Tumbling Dice the same night that Keith Richards joined Clapton. 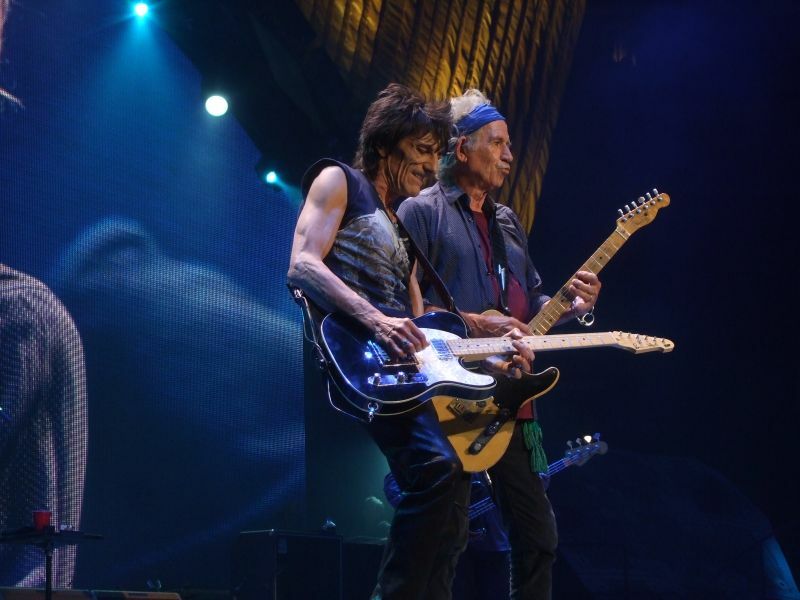 Urban really fit in well with the Stones, as Richards seemed to have a great time trading licks with him. He also declined to use the separate microphone set up for him, instead sharing a mike with Jagger. The song was especially delicious with Urban singing the ��my wife� lyric, knowing he is married to Nicole Kidman. Like his playing in New York last month, tonight�s show is allowing Urban to gain major credibility as a guitarist, and not just as a country music singer or Mr. Nicole Kidman. 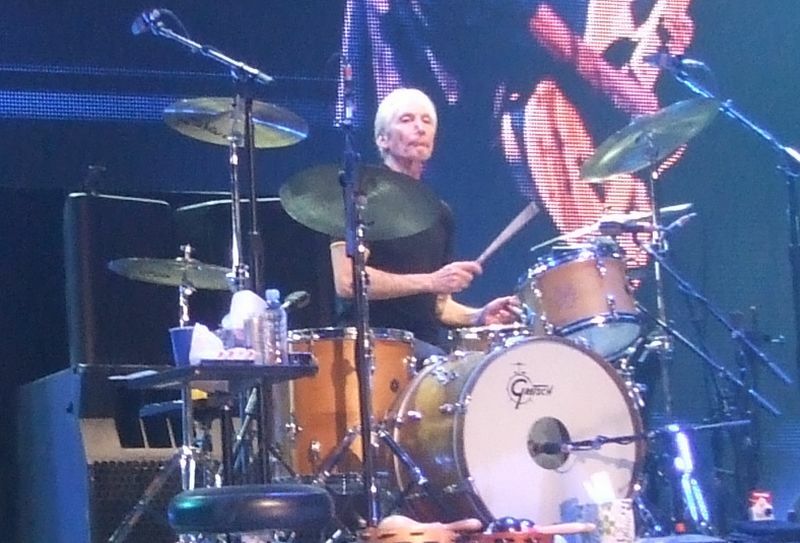 Factory Girl and Emotional Rescue were an amazing one-two punch for rarities, with Emotional Rescue being performed live for the first time ever. It had a more raw, reggae type bounce than the studio version, and the Staples Center crowd was very into it. It has always been an underrated song, and the title track of an underrated album. People always rave about Some Girls and Tattoo You, and ignore the fact that Emotional Rescue came out in between those two albums. Judging by the crowd�s reaction and the looks on the band�s faces, we will see and hear that song again before the tour concludes. Factory Girl compared well to the live version on the Flashpoint album, with both Mick and Keith playing acoustic guitars and Ron throwing in electric parts where appropriate. Mick Taylor�s participation tonight was perplexing. Last month�s press reports made it sound like Keith suggested Taylor would have a larger role than his single song appearance on Midnight Rambler during each of last year�s shows. However, tonight Taylor appeared only on Midnight Rambler, and did not join the band for the closing bow at the very end of the show. 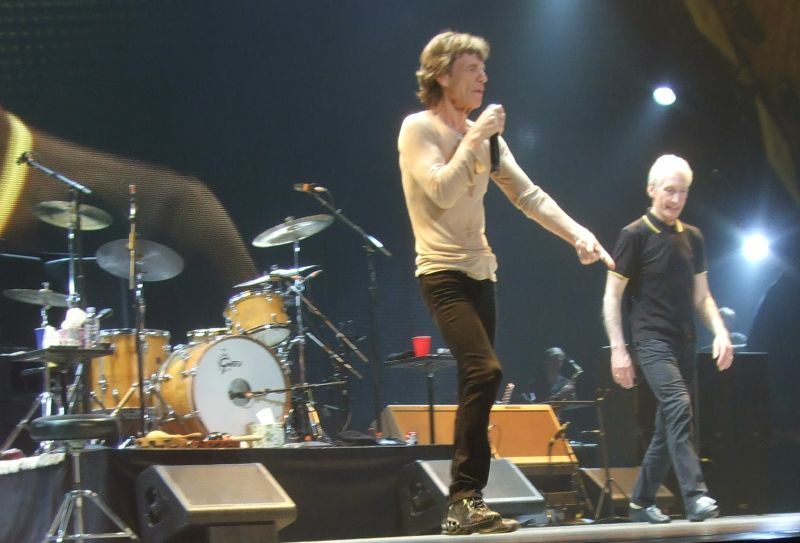 Compared to last year�s performances, Taylor started sloppier and sounded more rushed, but then as the song developed his playing was brilliant, complimenting Mick�s phrasing with mind-boggling timing and quality. This is one part of the show that is likely to improve, as Taylor seems more comfortable and confident with each appearance. I just hope we see him a bit more. 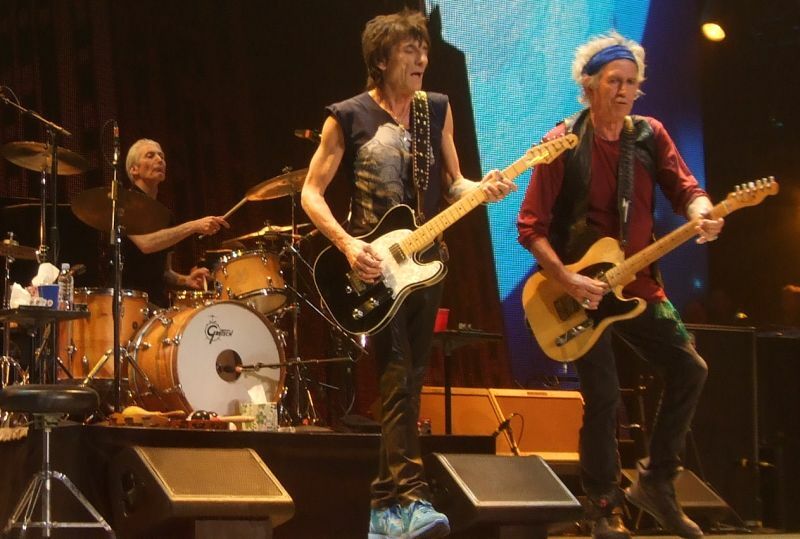 While on the subject of former Rolling Stones and guest appearances, this is the time to say that Bill Wyman is not missed at all, between his complaining about last year�s shows and selling coffee table books about the very band he is ridiculing. Darryl Jones� bass on Emotional Rescue, and his solo on Miss You are now crowd favorites and add fresh, uncritical personality to the music. Despite all of the talk of the band members� ages and slow ticket sales due to insanely high prices, tonight we saw new challenges taken on and expectations exceeded, and a packed Staples Center rocking without a pause. To fully appreciate the boundaries that the Rolling Stones are currently pushing with this tour, one need only look to the Stones website for perspective. It has recently featured selections from their 1981 appearance with Muddy Waters, who at the time seemed like the grand old man of the blues. Muddy was 68 years old for that show, one year younger than Mick and Keith are now. Great show, but absolutely no reason to pay more than $85 for a seat. Of course some fans will be happy to fork out megabucks for a guaranteed spot in the pit or front sections. But since this tour is just a continuation of the past few tours, with a few new wrinkles here and there, the $85 lottery is the recommended way to go. My wife and I ended up in Section 208, a decent spot opposite the stage where the retail rate was $485 per ticket (incl. $35 convenience fee). That's just theft. The people around us had $85 tickets as well. I assume those who paid full freight must have been feeling a bit nauseous. I suggest fans who have paid that sort of money offload their tickets as soon as possible. For me, the highlight of the show was -- me. I made it into the introductory fan video twice, but I won't go into detail. I'll just say that it's about time I shared equal billing with Cate Blanchett, Johnny Depp, Angus Young and Iggy Pop. The arena sound wasn't the greatest. They were well into the first song before I could tell what it was. It's almost like a Dylan show where you don't know what he's singing. 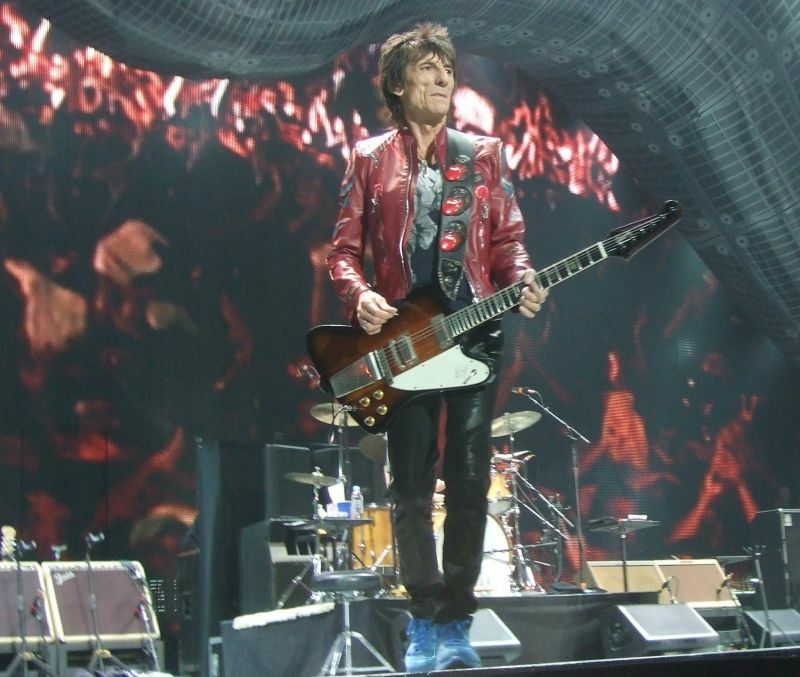 Other highlights were "Emotional Rescue" and "Factory Girl" and "Midnight Rambler." 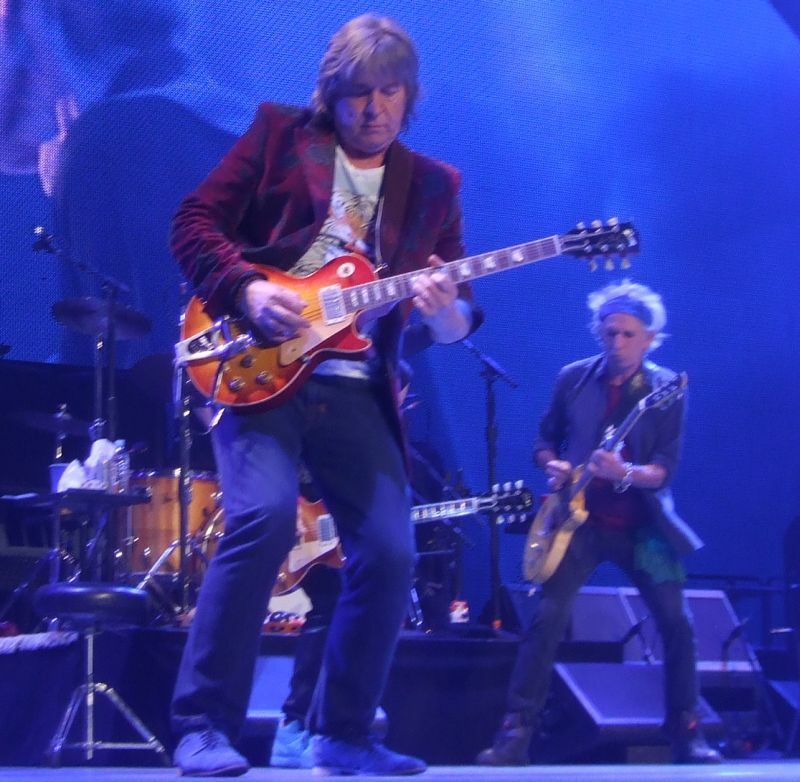 Mick Taylor was in full command of the latter song, and I admit there were moments when I wished I could have viewed it from a $650 seat -- up front, mind you, not a $650 seat at the back of the floor. Like many people here, I was shocked when he split after that one song. He's the main reason a lot of us are excited about this tour. There have to be some political shenanigans that we're not privy too. 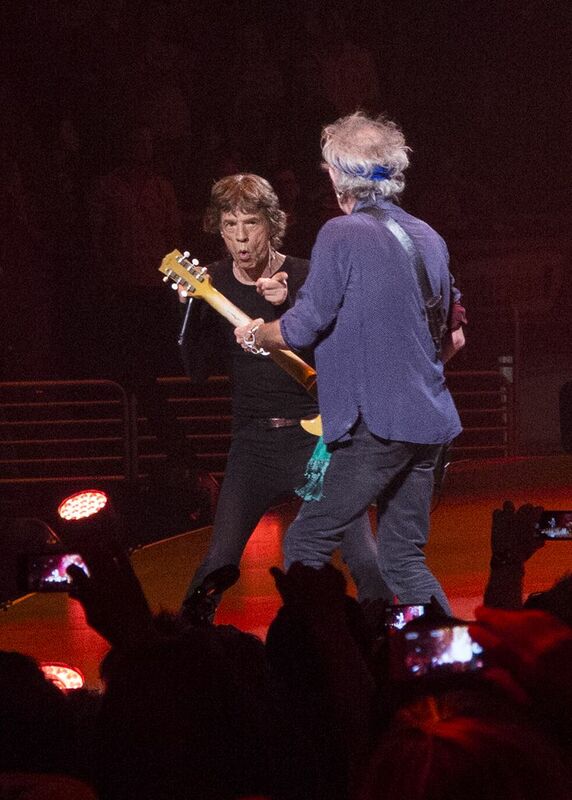 I was surprised that people in my section didn't seem to dig "Emotional Rescue." It will be interesting to see if it makes it to Boston. Two disco songs in the set is arguably two disco songs too many, though "Miss You" isn't going anywhere. That was the song that got people around me off their asses after almost an hour of sedentary viewing. "Factory Girl" was sublime, and a sign of what this tour could be if the Stones stopped being a circus act. The college kids were a nice touch on the "Satisfaction" and "You Can't Always Get What You Want." Under normal circumstances I quite like Gwen Stefani, and consider No Doubt to be a guilty pleasure. I believe she is the only opening act that has made full use of the Stones stage. Gwen was up and down the ramp when I saw them in Detroit in 2003. Alas, Gwen and her long blonde Lady Gaga wig were ill-fitted for "Wild Horses." She ditched her appealing plaintive vocal in favor of something in a lower register akin to Lucinda Williams. It was a shame. I realized afterwards that she botched her lines. Such errors don't bother me. It's all just for show anyway. Keith Urban is a great guitarist but otherwise about as bland as they get. He did an OK job on "Respectable" and was deferential to his namesake afterwards. I wonder what his prim wife thought about his singing "you're the easiest lay on the White House lawn." There's not much more that can be said about the rest of the show. They need to drop all the goofy graphics, though. "Honky Tonk Women" is bad enough without the silly "King Kong" reenactment. Cartoon boobies - what are we? Nine years old? Mick's gorilla suit at the start of "Sympathy for the Devil" was beyond Spinal Tap. And Keith's dentures. He could go into business as a lighthouse off the coast of Maine. I hope this review isn't perceived as too critical. 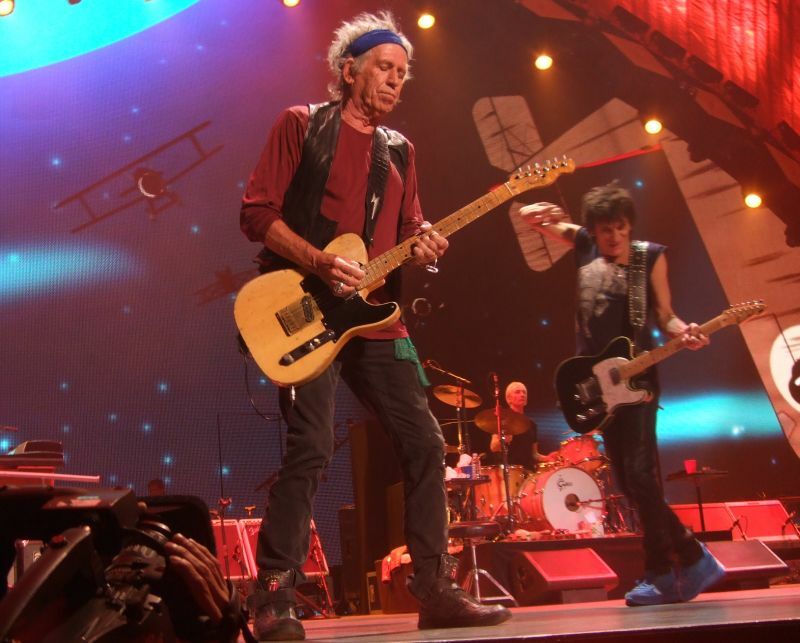 I got my money's worth after all, and the Stones work hard to put on a good, crowd-pleasing show. There's just no "wow!" factor anymore. It's the sort of act they can keep doing for quite some time. In Vegas. I have seen the Stones over 50 times in my life, beginning in 1966 at the Hollywood Bowl with Brian Jones. 3 of the first 4 songs last night were performed at that show, Cloud; Last Time; and Paint It Black. Actually the UCLA marching band opened with Satisfaction and of course the Stones rendition of the song was the final song from last night. Brian sounded like Hendrix during the '66 and '67 tours when they performed Satisfaction in the good old days. Having produced a compacted T-Shirt for The Licks Tour as well as living in Hollywood (born and bred here for most of my life) I have been fortunate enough to have been invited to backstage dinners with the band on previous tours. Pretzels and soft drinks were on the menu last night, quite disappointing to the lower elite who were expecting the normal full buffet. Last nights show convinced me that my notion back then in 1966, that the Stones are the greatest rock and roll group of all time still holds true. I know I will hear from The Beatles and Led Zep freaks, however the Stones have ruled for HALF A F... CENTURY. The Lick stage layout is real cool, especially the video screens which showed multiple designs of the Lick. I cannot believe just how professional, up to date and yet simple everything was. Great show, especially Emotional Rescue. Bobby Keys solo was so smooooth. We must remember that Mick is turning 70 fairly soon. This should give all of us over 40 crowd a bit of hope. Stay in shape and you too could be walking, singing and joking around at his age.